In 1981 she graduated the E.A. Buketov Karaganda State University in the specialty «Mathematician. Teacher». In 2005 she defended her thesis for the degree of candidate of technical sciences. In 2010 she defended her thesis for the degree of Doctor of Technical Sciences. 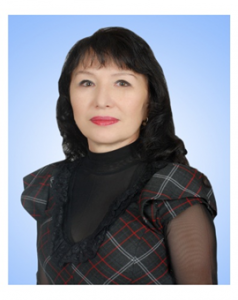 Winner of the state grant «The best teacher of high school of 2011»; Academician of the International Academy of Informatization; The winner of the scholarship T.Mustafin, 2012 .; Corresponding Member of the Russian Academy of Natural Sciences; Member of the Advisory Board of the International Alliance for Innovation, Technology and Training (USA); «Thank You Letter» NTC Republic of Kazakhstan, 2012., 2013., 2014.; A.Nobel’s Medal for contribution to the development of invention, RANS, 2014.; Winner of the state grant in the field of Scientific and Technical Research, 2015., A member of the Accreditation Council IQAA. Under the leadership of Kazhikenova S.Sh. a cooperation agreement with the International Alliance for Innovation, Technology and Education (USA, Texas), with an international center of excellence for professionals in the CIS Dusseldorf (Interkulturelle Weiterbildungsgesellschaft eV, Germany), Arizona State University (USA, Arizona) was signed. Author of more than 200 published scientific and methodical works, including 7 scientific publications in journals with impact factor, included in the international database Tompson Reuters, Scopus, 8 monographs. She has certificates of training international organizations.